It has been well highlighted, that a healthy workforce is a productive workforce and that is exactly the thought process which Yahoo! possesses as they decided to push upon their month-long fitness challenge. In an effort to shape up their tech loving employees, the American computing giant decided to team up with Jawbone and offer Jawbone Up fitness tracking wristbands to all workers who wish to take part in the monthly challenge. It is simple, all employees who accept will be given a Jawbone Up and allowed to keep them if they manage to run or walk 100 miles within a 30 day time period. 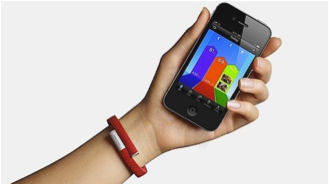 The device will track their progress to prove how far they have come in the month. The fact that Yahoo! have said they will let people who do not complete the challenge keep the wristbands, kind of takes away the incentive, however you would think most will still give it a shot. This is a great idea for keeping a healthy and motivated workforce, as well as gaining some great media attention, which is a bonus for Marissa Mayer, Yahoo Chief Executive Officer who coincidentally became a Jawbone board member in April as well. Despite all, this is yet another clear example of the rapid growth in the health and fitness tracking market, one, which we cannot see slowing down soon.